Most communication or marketing agencies use a single strategic model to set up a company’s communication strategies. The limit of this approach is that a single model is normally incapable of effectively representing and managing scenarios that are often very different from each other, and it proposes strategies that are not so good. Our BR.E.M.A. method consists of a set of the best strategic models used in business schools, consultancies and large Anglo-Saxon multinationals. Depending on the problem of marketing or communication and the various steps of strategic analysis, our strategists will then use all the models considered essential for a correct evaluation. Would you like to know more about BR.E.M.A. and its models? Call us for an introduction. Why a cost-effective marketing strategy is essential? 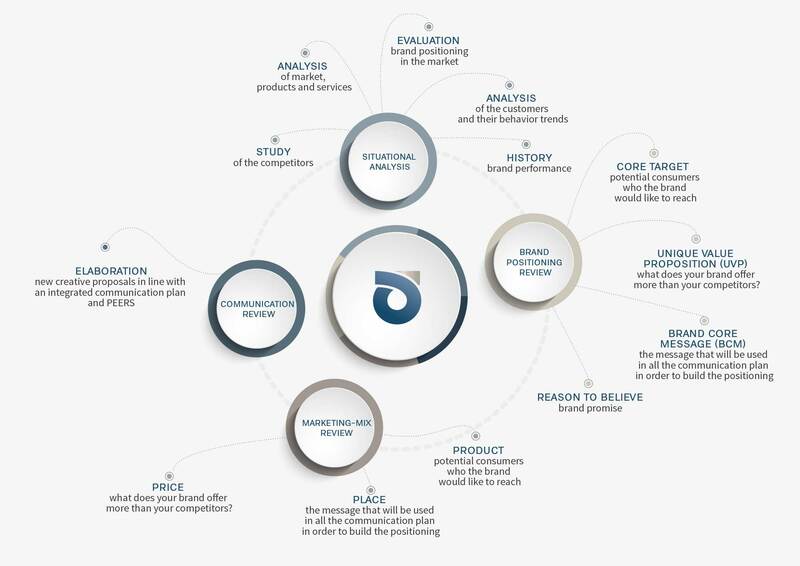 For any brand or enterprise, from a start-up to a large company, an effective marketing strategy must be the essential reference map for the whole activity. Only by developing and implementing a weighted and consistent marketing strategy it’s possible to promote and grow the company’s business adequately, identifying the most potential consumer target and correctly allocate its spending budgets, building a solid image and reputation of the company over time. a classic full service communication agency. Action: deep analysis of the scenario in which the brand or company is acting. Action: brand positioning proposal, which represents the fundamental and critical element of its marketing strategy. It must express effectively the set of values, characteristics, emotions, feelings and expectations that the company would like to inspire in its consumers. Action: key factors analysis of what determines the marketing strategies of a brand. All the packaging and products of the company must support and transmit brand positioning and values. Price has an essential role in market positioning into consumer’s mind. Product’s price of a brand is in line with the core target that you want to reach? Even the distribution must be in line with brand positioning in order to strength product’s values. Action: review the existing communication and elaboration of new creative proposals according to an integrated communication plan will include the declination of the Brand Core Message (BCM) on instruments and media according to the characteristics of the target core. The elaboration of creative proposals will be carried out also considering the persuasive techniques of our model P.E.E.R.S. to maximize CTA (Call-To-Action) ensuring a faster achievement of communication objectives and ROI.